I love good sentences. I really do. The best sentences are ones that show off brilliance without being show-offy. They pulse with the vitality of language and they aren’t any longer than they need to be. 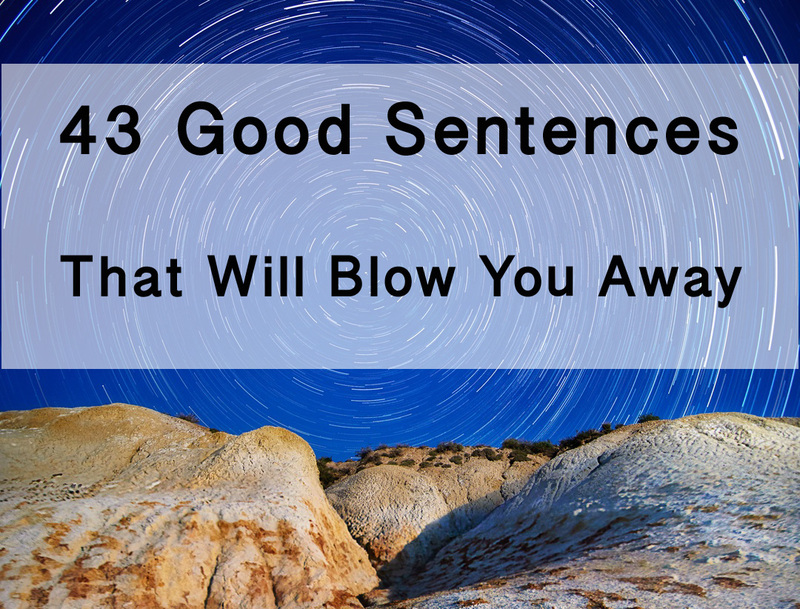 Below you’ll find 43 good sentences. Solid sentences, sentences that you would be proud to bring home to Mom and Dad. Marriage-worthy sentences. Ultimately, these sentences will repay your close attention. Under careful scrutiny, they will open up like flowers and reveal to you the wonders of the world. I’ve spent years collecting the good sentences here in a file that I reserve for only my best sentences. I give them to you hoping that they will inspire to write more beautiful sentences, inspire you to read more looking for these type of gems, and that they will make your life just a little bit more gorgeous. 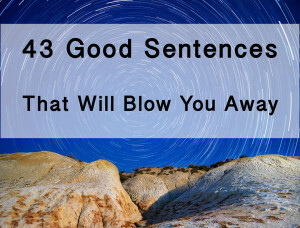 If you want a few more sentences, check out my post of 100 Beautiful Sentences. I’d also encourage you to start a file with good sentences, too. Ones that rock your soul and upend all your expectations about language and about the world. You’ll never know when you might need inspiration. If you don’t like one or two of these, wonderful. I would love to hear about why you don’t like them in the comments. If you love one or two of MOST of these, I would love to hear which ones struck you to the core. Because ultimately, like all art and things pertaining to beauty, “good” is subjective. The only definition for good that I don’t like is one that doesn’t pay attention to language. Because for me, a good sentence isn’t just about whether the language communicates a great idea; a good sentence has to showcase the infinite flexibility and brilliance of language itself. Thanks for reading these! I hope you found what you were looking for. Remember to leave a comment below about your favorite one (or your least favorite one! ), or to list a good sentence that you think I missed. #11 is easily my favorite, though I wouldn’t say it “struck me to the core.” Such a punchy character description, with bizarre humor. I like something that can make me laugh even though it’s not overtly funny. I loved this sentence by Caitlin Moran, which was actually one of the character descriptions you quoted – thanks for your articles. This is by far the best list of beautiful sentences I’ve found, instead of the usual copy and pasting of well-worn classics. Your hard work in compiling these is not unappreciated! Thank you. You’re welcome. Glad you’re enjoying them.